After three amazing years of supplementary feeding for the surviving Leadbeater’s Possum colonies at Lake Mountain following the 2009 Black Saturday bush fires, our work is done. The amazing efforts of our volunteers kept those two families alive for three years under extreme conditions. As the vegetation grew back on the plateau, the other animals started to come back to the area… starting with rodents. We think that may have brought some of the predators back as well. Since the fires we have been finding dog scats and over the last year Sambar deer and feral cats have been caught on camera traps close to the area where the possums survived. 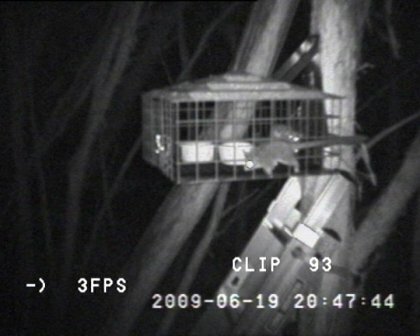 After reviewing video from the cameras on the nest boxes and the feeding stations, it was discovered in December 2011 that some of the possums were missing, and did not return. Over the Christmas period extensive searching was done to try and locate the other possums but it was determined they were likely to be lost and the Recovery Team approved the rescue of the remaining three animals (one adult female and a sub-adult male and a juvenile male from another family group). Soon after, the animals were brought in to Healesville Sanctuary. Just 7 hours after their recovery, video footage from Lake Mountain showed a large feral cat on top of their feeding station – we can assume that cat may have been responsible for the demise of many colony members. While two have adapted well to their captive environment, one animal was found dead in its enclosure in 2012 from unknown causes. DSE has recently advised Healesville Sanctuary that the remaining animals from Lake Mountain are to remain in captivity and not be returned to the wild, as the revegetation is not yet sufficient to support their survival and feral predators are still an issue. It was very emotional for many of our members to hear they were to be brought into captivity, particularly after all our efforts to keep them in the wild. We are very proud of the contribution we made to help those animals. They surely would not have survived without us. We thank everyone who dedicated their time and effort to help feed those surviving possums, particularly the volunteers who went many times each year over the three years. We will keep you posted on any future plans for these animals. Between 2009 and 2011, FLBP assissted Parks Victoria with supplementary feeds to the remaining Leadbeater’s Possum survivors from the February 2009 bushfires. The habitat at Lake Mountain was seriously affected by these fires and has not significantly recovered to ensure an ample food supply for the possums over the more extreme weather that winter can bring in these alpine areas. A minimum of 2 FLBP volunteers were needed for each day’s activities to deliver the required nectar to feeding stations at designated locations on Lake Mountain. This was a daytime activity and required volunteers to have a medium to high level of fitness to walk or ski when there was sufficient snow. The circuit was approximately 10 kilometres return. Community thanks Leadbeater’s Possum volunteer supplementary feeders. 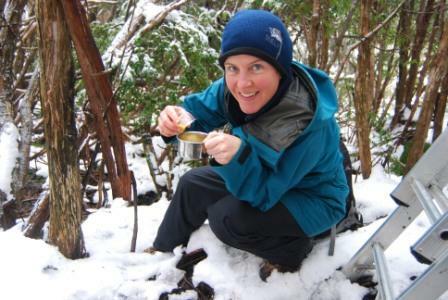 Maroondah & Yarra Ranges Weekly – June 2011. At least one volunteer with a “Working at Heights” ladder training was required to deliver the feed into the raised feeding stations. Observations were recorded and added to an ongoing monitoring program for supplementary feeding Leadbeater’s Possum.